Learning the proper care for hibiscus will ensure that your plants live a long time. These beautiful plants can be used to grace your home's landscape or as a lovely houseplant. The following tips and guidelines should help you get your new plants off to a great start, or help you diagnose problems with established plants. The hibiscus plant enjoys warmer climates. The ideal growing temperature for these plants is between 60 to 90 degrees Fahrenheit. If you live in an area that has cool evenings, you'll want to grow your hibiscus plants in containers so they can be easily moved indoors. For those gardeners that live in cooler climates, you can grow hibiscus plants in containers. During the warmer months your potted hibiscus can be placed outdoors and brought in overnight when the temperature dips below 60 degrees. Keeping hibiscus in containers is also a great way to enjoy these plants year 'round indoors.In order for your potted hibiscus plants to stay healthy, keep them slightly root bound. If you decide to put them in a larger pot, choose one only an inch or less in diameter larger than the one it is currently in. Hibiscus plants need excellent drainage, so be sure that your container has enough drainage holes in the bottom before you plant your hibiscus. Hibiscus plants like to be in well-drained soil. You can test the soil where you intend to plant by digging a hole, pouring in a gallon of water and watching to see how quickly it drains. If it doesn't drain right away, this area may not be suitable for your hibiscus. Water that pools around the bottom of your plant can lead to fungus problems. During the warmer months your hibiscus plant will need to be watered daily. Once temperatures become cooler, water your plant less. If you over-water the plant, it can die. The best way to tell if your plant needs water is to stick your finger into the soil around the plant. If it is dry, it is time to water the plant. The hibiscus plant likes fertilizers high in potassium. Avoid using "super bloom" products that contain a large amount of phosphorus. This will keep your plant from absorbing other nutrients that it needs. Hibiscus plants can be fertilized in a variety of ways, from foliar to time-release methods. Whichever way you choose, be sure to carefully read the instructions on the product container. 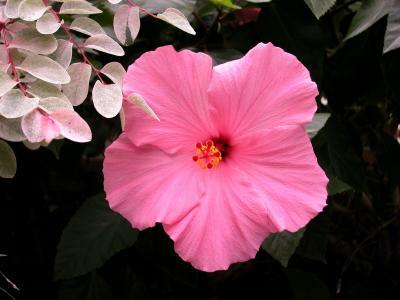 The hibiscus plant can be pruned in the spring and summer, but not fall and winter. Recently pruned plants are susceptible to damaged caused by cold temperatures. It is always preferable to prune a plant after it has bloomed. New blooms should appear in about three to four months after pruning. When choosing the area to prune, make the cut approximately ¼ inch above any newly forming bud. Always use clean pruning equipment on your plants in order to avoid transmitting plant diseases. The care for hibiscus plants is fairly easy. The plants can be grown indoors or out, depending upon the climate. These plants aren't very temperamental, and as long as they are fertilized periodically and watered correctly, they should provide enjoyment for years to come.